Exterior Architecture working with Guy Holloway Architects have prepared landscape proposals for the Kent Wool Growers site in Ashford, Kent that is to be submitted for planning this week. The proposals establish new links between Ashford International Station and the town centre, and include a new bridge over the Great Stour, River designed by the artist Alex Chinneck who is known for his surreal contextually responsive interventions, which includes turning a disused building on the site into a temporary giant zip. The sites notable historic past is reflected in a series of gardens that seek to celebrate the history of the site and improve the setting of the grade II listed Whist House. 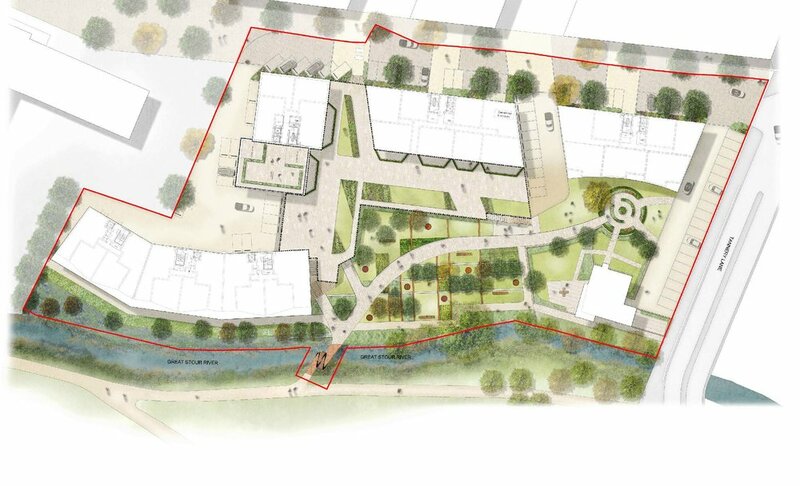 These include the Tannery Ruin Gardens, which is based on the footprint of a Tannery building that currently occupies the site and includes features derivative of the tanning process.